The enjoyment of your beautiful yard doesn’t have to end when the sun goes down. With the right outdoor lighting and landscape lighting from Hortons, you can fully enjoy your evenings outside. The proper placement of outdoor lights can guide you on a casual stroll around your home, or provide you with a pleasant view from your window. Outdoor accent lights can be used to highlight walkways and silhouette trees and shrubbery. Brighter outdoor lights add functionality to your home, allowing you and your guests to stay outside long after the sun has set. One added feature of exterior lighting is security; a well-lit home is a proven deterrent for intruders and trespassers. Outdoor timer lights can increase your home security every night. Outdoor motion sensor lights can be set to come on only as needed. Hortons Home Lighting can help you find the right lighting combination of practicality and functionality for your home. 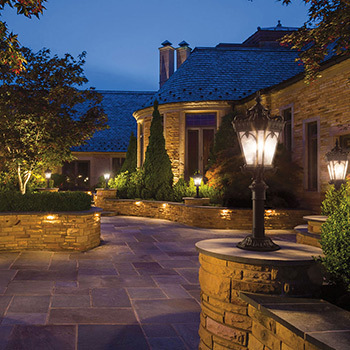 Just like other landscape features, outdoor lighting adds appeal and value to your home. Proper placement of landscape lighting can create appealing nighttime visuals as well as increase your sense of safety regarding the outdoors surrounding your home.